Check out How to Create a Hello Friend Card by FotoBella Papercrafting Supplies on Snapguide. Hi Friends! 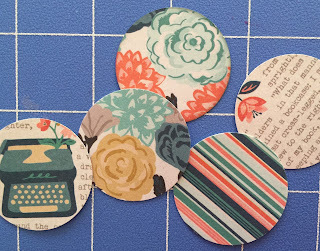 ReNae here with the FotoBella Design Team, and do I have a fun project for you today!! We are going to make a cute and super easy card using only a paper trimmer, a circle punch, a scallop punch, and the fun & funky embellishments you receive when you buy the Typeset "I Want It All" Bundle from Basic Grey and FotoBella! I love this paper collection. The colors are soft and right on trend, in fact, most of these colors are on the Pantone 2016 Colors of the Year. The embellies are so fun and so in right now! This collection will be perfect for all ages and it's good for boys AND us girls! 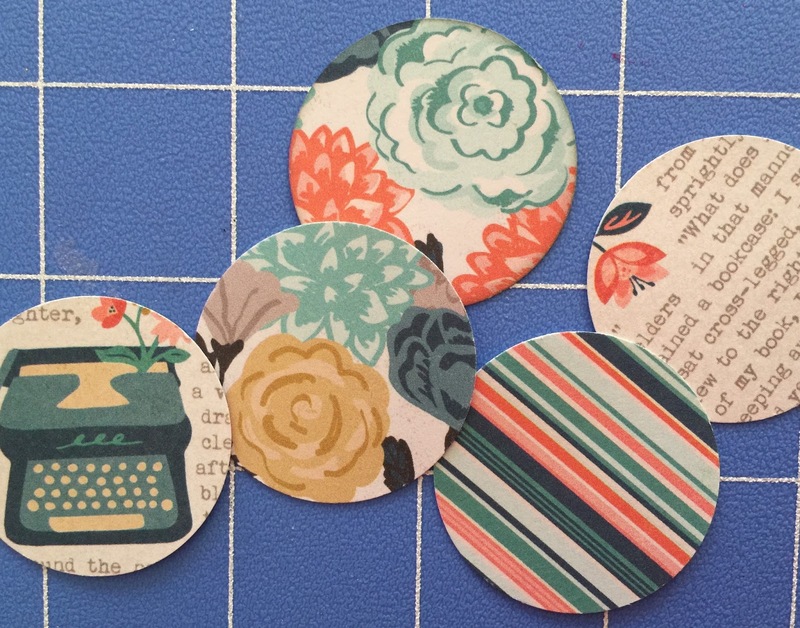 Note: As some of you may have already learned, Basic Grey is halting production in their paper craft division and focusing solely on the quilting and textile division. So get it while you still can! We are going to make a card measuring 5 1/2 x 5 1/2 . 1. Start with a piece of off-white card stock measuring 8 1/2 x 11" and cut it down to 5 1/2 x 11", then score it at 5 1/2 inches to create the card BASE. 2. Cut 2 strips of the grey paper with the white dots, and cut them at 2" x 5 1/2. Distress Edges. Select these papers for the next few steps. 4. Cut a strip measuring 5 1/2 x 2 inches from the orange polka dot paper. Distress Edges and set aside. 5. Cut a strip measuring 1 1/4 x 5 1/2 from the blue "hello" paper. Distress Edges. Adhere to the top edge of the orange paper. Adhere it so that one inch extends from the orange paper. 6. Cut a strip of plain blue paper measuring 1 " x 5 1/2. Punch scallops using an edge punch. Adhere to bottom of orange strip so that the scallops extend from the edge. 8. Punch 3 circles using the circle punch, and adhere them side by side on the orange strip of paper. 9. Remove two flairs stickers from the Flairs pack in your bundle and place as shown. 10. Remove the letters FRIEND from the epoxy alpha sticker sheet and adhere to the card on the right side of the scallops. 11. 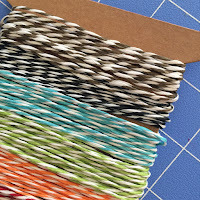 Cut an 18 " length of baker's twine in Grey/white or Black/white and run through the two layers of paper on card front. 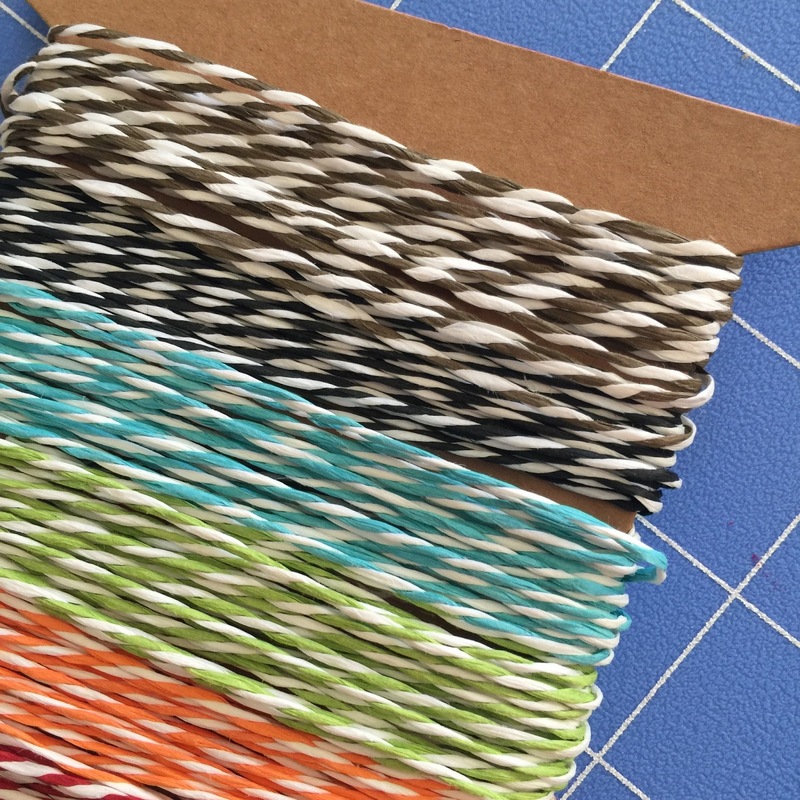 Push twine towards top of card and tie a bow on the righthand side. 12. 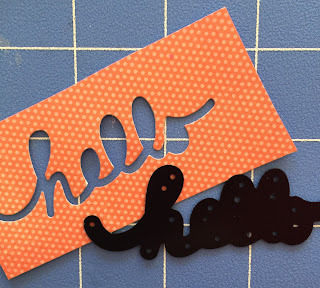 Optional: Cut a die cut "Hello" from the orange polka dot paper and adhere to top left side of card. I used this little die from my stash. This is the finished card with the "hello" die cut. For fun I stamped the envelope with a hello stamp I had in my stash. for almost any occasion so please give it a try! Post your finished card in the comments section below! A winner will be chosen at random from the participants! Fantastic card and tutorial!! Love the vintage phone embellie and twine!